Are you going to build your new website for mobile users? Have you ever developed it before? A Mobile website is a completely different thing from the Desktop website. Today, developing a website as a Mobile compatible is the finest way to have a greater reach and good constant traffic. Today, if you ignore mobile users, you will lose visitors. Smartphone usage is growing at a lightning speed. And one thing is clear: there are millions of users who are accessing the internet via their mobiles. In the last 3 years, mobile users and its usage have increased by 40% and desktop usage has fallen from 90% to 50%. Follow this trend and make your website mobile friendly. Ravi is driving a car and trying to buy a gift for his lovely wife. He is on your website. The car is moving 90 km per hour. How can you help him to buy the perfect gift? Create a mobile website with a touchscreen-friendly navigation that makes it easy for your potential customers to find they need on the go. Excellent! You are on the right post. Now how to make such websites. Here in the article, I am going to list 10 best practice for mobile website development. Responsive design: make the page, URL, images and everything remain same the only CSS give it a different look based on browser width. RESS/Adaptive/Dynamic Serving: In which URL remain the same but server send different HTML CSS based on device type. Mobile Site: This type of website hosted on subdomain e.g. m.domain.in. 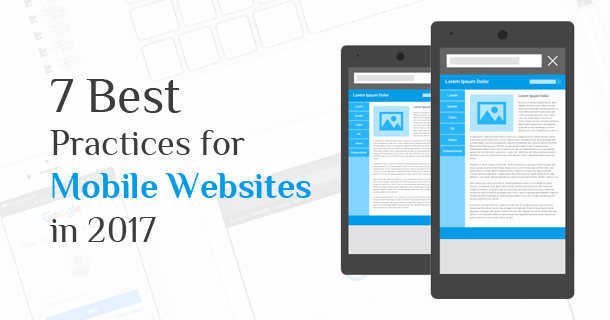 If you want to spend low budget or limited resources on the mobile web you can use user-friendly content management system like WordPress. You can buy a premium template, there are thousands of themes available online. Always chose a light weight and fast theme that is optimized for a mobile device. Heading of your content should be shorter and sweet do not wrap heading over more than 2 lines it pushes your content down the page and out of the frame for users. Make them short and focused without telling the whole story. In small input form where context is obvious. You should use placeholder text instead of labels for e.g. login form, search box and address box. According to google guidelines speed (Website Loading speed) helps in ranking and it is the most important factor for a mobile site. Don’t use high quality images to achieve fancy effects like gradients and shadows. Learn the basics of what is possible with CSS and incorporate those into your design. Each mobile device has different dimensions. Don’t just design for a 320-pixel width devices there is plenty of width like 176,240,320,360,480,600 dimensions. Make your layout flexible and fluid ensures it displays on different screen size. Smartly used icon can improve performance of responsive mobile web design in a number of ways. Well designed, appropriate iconography help replace lengthy bursts of text, which is especially helpful on smaller screens where space is at a premium. Ashish Sharma is a Key Account Manager, looking after Marketing Strategies and building new business tie ups at WeDigTech – A hub of Skilled Mobile App Developers in India. Focused on helping enterprises StartUps from domestic to MNCs.